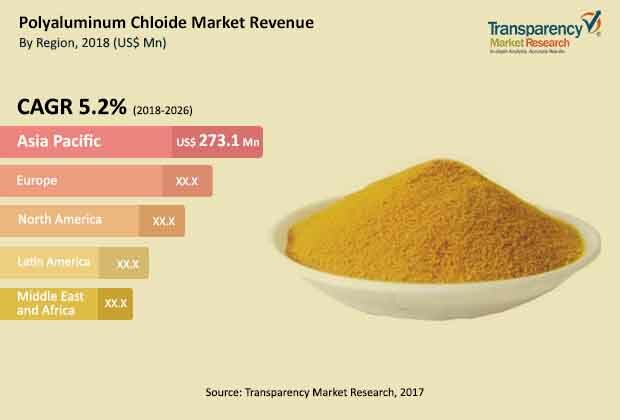 The competitive landscape of the global polyaluminum chloride market is largely consolidated in nature, says Transparency Market Research (TMR). Top players in the market are focusing on strengthening their manufacturing bases. This is because higher manufacturing rate is directly proportional to the growth in the global polyaluminum chloride market. For instance, in May 2018 Geo Specialty Chemicals Inc. expanded its manufacturing unit by opening a new specialty chemical facility in Hythe, UK. The ability of the global polyaluminum chloride market vendors to seamlessly manufacture polyaluminum chloride will decide their dominance in the global poiyalumium chloride market. Further, mergers and acquisitions, business expansions, collaborations are the primary strategies adopted by key players to tap growth. Some of the prominent players operating in the global polyaluminum chloride market are Gulbrandsen, Geo Specialty Chemicals Inc., Nippon Light Metal Company Ltd. (NLM), and Feralco Group. According to a recent market report, the global polyaluminim chloride market is anticipated to attain a valuation of by S$ 1,080 Mn by 2026. The market is projected to rise at a CAGR of 5% from 2018 to 2026. On the basis of geography, Asia pacific is likely to hold key share in the global polyaluminum chloride market during the forecast period. The region is expected to attain a valuation of 273.1 mn by the end of forecast period. On the basis of application, industrial water treatment is expected to hold a major share in the global polyaluminum chloride market. This is because of the increasing demand for discharge industrial water safely. Polyaluminum chlorid is widely used in number of end user industries. Some of them are cosmetic and personal care industry, water treatment plant, Pulp & Paper and Textile Industry. This is mainly because of its excellent properties such as low iron content, high purity, consistency, and stability. The demand of polyaluminum chloride is increasing in water treatment in the upcoming years. This can be attributed to stringent laws formulated by regional regulatory bodies for the disposal of waste water. The effluents released by the industrial sector has a severe impact on ecology. Polyaluminum chlorid is used for the separation of effluents from the water to make it safe for disposal. The is likely to drive the global polyaluminum chloride market during the forecast period. Apart from this, the superior properties of polyaluminum chloride such as less alkaline, less sludge formation, effective coagulation and flocculation as compared to alum is another factor likely to boost demand of polyaluminum chloride among the end use industries. This is estimated to have a positive impact on the growth of the global polyaluminum chloride market size in the forecast period. On the flipside, week infrastructure of waste water disposal mainly in developing economies may hamper growth of the polyaluminum chloride market. However, increasing international pressure over the safe disposal of the waste water to control water pollution can counter restraint in the polyaluminum chloride market. Apart from this, growing awareness among the entrepreneurs and common people regarding the harmful diseases caused by the exposure to effluents discharged from industrial sector is likely to offer ample of opportunities for the growth of polyaluminum chloride market size in the coming years. The review is based on TMR’s report titled, “Polyaluminum Chloride Market (Form - Liquid, Powder; Application - Potable Water Treatment, Industrial Water Treatment, Pulp and Paper Sizing, Decolorization in Textile Industry) - Global Industry Analysis, Size, Share, Growth, Trends, and Forecast 2018 – 2026”.